Can the Corp install ice with New Construction's ability? No, ice is installed protecting a server not in a server. New Construction is one of two available "public" 4/2 agendas available to Weyland. 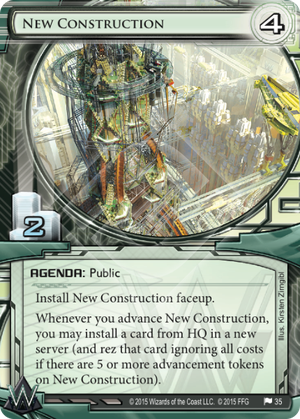 The other, Oaktown Renovation, is arguably the best Weyland card released since Blue Sun: Powering the Future. Both agendas fulfill similar roles (preventing tempo loss while trying to score) and both have similar weaknesses (must be played face up, 4 advancements to score). So, how does New Construction stack up? Let's take a look. First, instead of spending money to advance, with Oaktown you actual make money. This means you can potentially score from a single credit and be close to Hedge Fund range by the end of your next turn. More importantly though this allows you a bit of wiggle room for rezzing ice. You can throw Oaktown down behind ice you can't quite afford and advance into rez range. This is an enormous boon for Rush decks that want to score out fast behind early ICE without a stable economy. However, Oaktown's benefit is so universal that it sees play in a wide variety of deck archetypes. With New Construction on the other hand, you are still losing money while advancing, but you are instead saving clicks in the form of installing assets and upgrades. (Important side note for new players: installing cards in a server is not the same as installing them protecting a server, therefor you cannot use this agenda to install ICE in a new server.) The difficulty here is that you need a lot more money up front to comfortably score next turn and still rez ICE in response to Runner threats. Also, unless you reach a fifth advancement on New Construction, you still need money to rez these assets and upgrades. So, ideally you need a rather hefty amount of cash to defend, score and capitalize on New Construction's unique benefit. This leaves several popular Weyland archetypes, such as Rush or SeaScorch decks, in the position of not being able to utilize New Construction. But that's okay -- you don't need it there anyway. Instead, this agenda opens up opportunities in relatively unexplored territory for Weyland: horizontal and asset spam decks. Enter Gagarin Deep Space: Expanding the Horizon, an ID that has been teetering just on the edge of being a force to be reckoned with. Gagarin's self protecting remote servers, combined with the tempo advantage offered by New Construction and a large amount of high priority asset targets can make for a very threatening deck. New releases such as Dedication Ceremony, Mumbai Temple and Museum of History create even more possibilities. Oaktown Renovation is probably still a better card for the fact that it is a more universally beneficial ability, but in the right deck New Construction has a lot of potential.